The Wrap-Up List by Steven Arntson. Review: "It wasn't easy at first," says GabrielaÉbut what she doesn't know is that it's not going to be the only thing not easy. 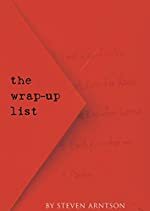 Steven Arnston creates The Wrap-Up List, a book that will peak your curiosity with a suspenseful plot, a hint of romance, and a thrilling twist. Gabriela, the girl with seven days to live is the protagonist and is also a well- rounded character. The author has a lot of key elements in writing a book that will interest readers such as believable characters. Clues, mysteries, and secrets are waiting to be uncovered and revealed throughout this book. Intriguing plot, creative characters, and a natural setting are the elements in this book. Imagine a 16-year old girl named Gabriela with her death at her fingertips. Gabriela is a normal teenager, but not for long. She receives a nerve-wrecking letter sent to her by Death. What's a Death, you ask? Well, it's a creature with a greyish silverfish skin and it's about 8 ft. tall with gills. Gabriela finds that she has precisely seven days to live and fulfill her wrap- up list, a list filled with her desires. In this case, it's a first kiss from her secret crush, Sylvester Hale. Also, she has other first kisses to make come true for her three best friends, Iris, Sareena, and Raahi. Gabriela has one last chance to figure out Death's weakness and trick him into letting her go. It's going to be a week requiring a fist full of cleverness, determination, and cooperation. My personal opinion is that this book possesses almost all the significant features in a breathtaking book. The only part that I dislike in this book is the fact that when the book explains something like an object, it goes into too much depth; it feels like plodding. For instance, when Gabriela is driving to church, the car is very explained in detail. Otherwise, the rest of the book is wonderful. The plot is suspenseful and the action ties the book together. The characters are unique and fascinating. They are altogether very daring, skillful, and determined. For example, Iris, Gabriela's best friend, is superstitious, and she assumes everyone is heading for departure. Plus, the protagonist, Gabriela, has a different personality. She exhibits multiple qualities like generosity because she uses most of her wrap up list for her friends and is determined to find out Death's weakness. The author's writing style is very descriptive and lively, and the engaging dialogue motivates the reader to never stop reading. The Wrap- Up List deserves four stars out of five. The theme of this book can be applied to anyone: Life is like a roller coaster--- you never know what will happen next, so always be prepared! We would like to thank Houghton Mifflin Harcourt for providing a copy of The Wrap-Up List for this review. Have you read The Wrap-Up List? How would you rate it?